There is little documented evidence of how countries in sub-Saharan Africa and the Southern African Development Community (SADC) approach mathematical learning difficulties and inclusive education. With public resourcing limited and focused on access to education, problems of poor-quality education are well documented. Far less research is available relating to how this impacts on mathematics learning in general and inclusive mathematics practices in particular. This chapter presents an overview of the countries in SADC drawing on international metrics characterising the countries, relative mathematics performance of SADC countries against other countries and relative performance amongst SADC countries. 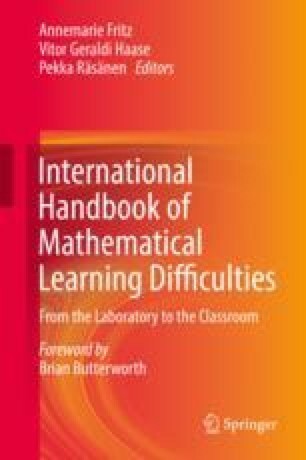 It then describes the environment and approach to mathematical learning disabilities (MLD) in four example SADC countries – Zimbabwe, South African, Lesotho and Malawi. It argues that the lack of attention to mathematics learning disabilities (MLD) as distinct from requirements for a general improvement in education is considered to be both understandable and appropriate. The pressing needs relating to improving basic infrastructure (clear water, sanitation and electricity) in schools, large class sizes and insufficient access the textbooks mean that little time and very little of already scarce resources are invested in diagnosis and remediation of mathematics learning disabilities for individuals. Significant gaps in availability of validated instruments to diagnose and then intervene to support learners identified as having mathematical learning disabilities are made evident. Accurate identification of learners with MLD is only meaningful and appropriate in systems that are able to remediate and offer support to those affected. Some progress to this end is evident in South Africa with the development of some validated instruments with South African norms, in four African languages. Far more is required for the evidence from these small-scale efforts, to be fully utilised to benefit all SADC countries. This paper was a collaborative effort. The country contexts were written by mathematics education researchers who are citizens of each country: Malawi (TS), Lesotho (NM), South Africa (NR) and Zimbabwe (LT). TS was completing his PhD, on an NRF scholarship, as part of the South Africa Research Chair: Integrated Studies of Learning Language, Science and Mathematics in the Primary School at the University of Johannesburg. TS was on study leave from the Malawi Institute of Education. NM was research, publications and consultancy coordinator at the Lesotho College of Education. LT was a mathematics trainer and researcher with AIMSSEC and completing her PhD in mathematics education. NR (corresponding author), in the Centre for Education Practice Research in the University of Johannesburg’s Soweto campus, was responsible for all of the other sections. Department of Basic Education. (2013). National policy pertaining to the programme and promotion requirements of the national curriculum statement Grade R-12. http://www.education.gov.za/Portals/0/Documents/Policies/PolicyProgPromReqNCS.pdf?ver=2015-0. Accessed on 27 July 2017. UNESCO Institute for Statistics, country profiles. (2014). http://uis.unesco.org. Accessed on 28 July 2017.